McLane steel subsurface flotation is a cost effective solution for shallow water and coastal buoyancy requirements down to 380 metres. 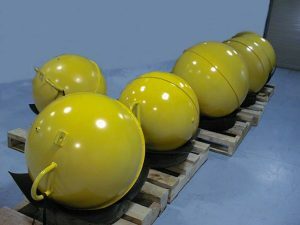 With a heavy steel construction and durable finish, our highly efficient buoys withstand the harsh ocean environment and strenuous deployment procedures. McLane Steel subsurface flotation feature an equatorial ring for strength, a strong straight-through central strain member, lifting beckets and sacrificial anodes. 41” (898 lb, 407kg buoyancy).